The aluminum enclosures are pretty and all, but it's the sound that makes these headphones worth the price of admission. There was a time when listening to music through Bluetooth headphones was akin to listening to MP3s: If you really cared about music, you just didn’t do it. The fidelity of the MP3 files will never get any better, but the quality of audio streamed over Bluetooth has improved in leaps and bounds. Case in point: Optoma’s NuForce BE6i wireless in-ear headphones. 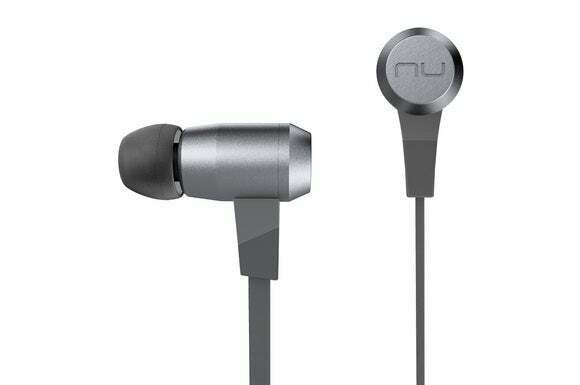 These aren’t super-high-end buds—there’s a single 10mm full-range driver for each ear—but they deliver very good performance for $129 (available from Amazon). Part of that can be attributed to their support for the AptX codec. The BE6i’s drivers are housed in barrel-shaped enclosures attractively fabricated from aluminum and are very light in weight: just 0.6 ounces according my postal scale. The BE6i are probably more water resistant than they need to be, with an ingress protection rating of IPX5. That means they’re protected from water jets, so they’d probably survive if you forgot to take them out before you hit the shower after a workout. The X before the 5 means they’re not certified for protection from dust. Magnets hold the two buds together to prevent the cord from tangling while in storage. 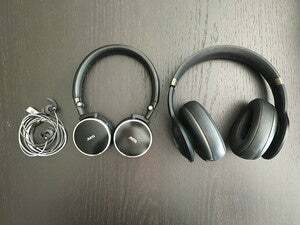 A 23-inch rubber ribbon cable connects the two earpieces, which attach together with magnets when you’re not using them. An inline control module has mic, a status LED, and three raised multi-function buttons that are easy to locate with your fingertip. 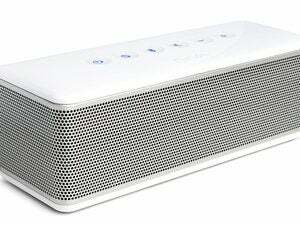 Briefly squeeze the top or bottom button to raise or lower the volume respectively. Holding these buttons down for two seconds moves you up and down your track list on a paired smartphone or digital media player. A short squeeze on the middle button toggles between play and pause, while a long press powers the headphones off. The middle button is also used for managing phone calls, with a quick squeeze answering a call—or terminating one in progress. I didn’t think the BE6i would be comfortable for long listening sessions at first, because they have a somewhat large ear tube, but changing ear tips remedied that situation. Optoma provides six pairs of silicone tips to accommodate different ear sizes, plus two pair of Comply memory-foam tips; it was the medium Comply tips that changed my mind. They were much more comfortable and provided better isolation from ambient noise than the house tips (these headphones don’t offer active noise cancellation). Optoma also provides a carrying case, a stubby USB charging cable (but not a USB power adapter), a retainer clip, and one pair of ear hooks to prevent the headphones from falling out while you exercise (I didn’t evaluate these). 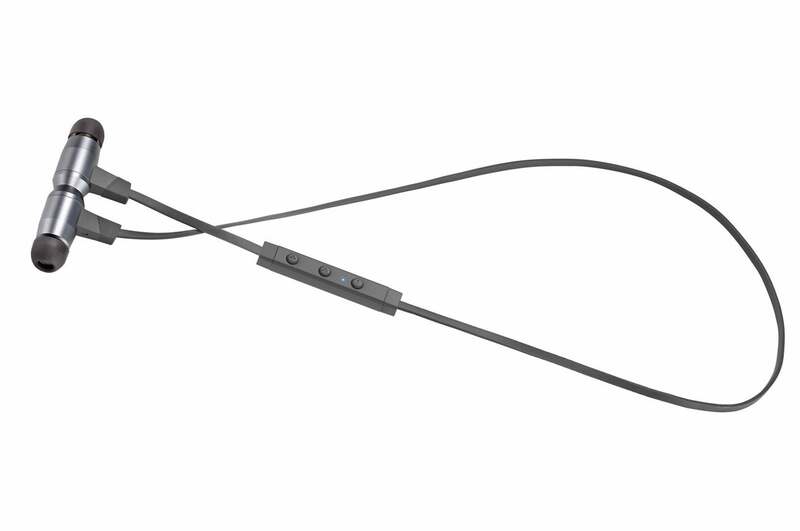 You can attach these hooks if the headphones fall out of your ears while you exercise. Optoma says the BE6i will operate on battery power continuously for up to eight hours, a claim I did not verify. But you’d better have long fingernails to pry open the panel covering the micro USB port. Maybe it gets easier over time, but it was a pain in the neck the first couple of times I charged it. Then again, perhaps that’s necessary to achieve that IPX5 rating. 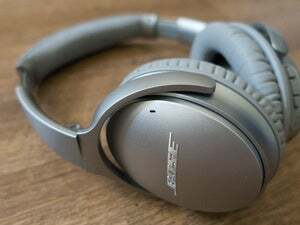 I was very pleased with the BE6i’s performance as a Bluetooth headset. People on the other end of the line said my voice came across clearly, and I perceived only the tiniest echo coming from them. Music paused quickly when incoming calls came in, and the buttons for answering and terminating calls worked quickly and reliably. Awfully nice of Optoma to include Comply ear tips in the purchase price. I was even more satisfied with their musical performance, considering the price. Those single 10mm drivers did a remarkable job of presenting the full spectrum of sound. Annie Lennox’s “Money Can’t Buy It,” from her album Diva, opens with a pick-up note from the drummer’s cymbal, immediately followed by a deep note from an electric bass that’s enough to rattle you fillings. More sounds are layered in as this groove builds over the next 12 measures before Lennox’s voice enters with the first verse, but the BE6i never failed to deliver the higher frequencies from instruments such as the claves, tambourine, and chimes without muddying up that fat bass foundation. The BE6i deliver great range, too. Optoma claims 100 feet, but I traveled only about 80—outdoors and in line of sight of my phone, mind you—before the audio stream began breaking up. Indoors, I was able to roam about 40 feet, with two insulated interior walls in between, before the stream dropped out and a pleasant female voice with a British accent informed me that the primary connection had been lost. She also let me know when I had come back close enough to the phone for the Bluetooth connection to be re-established, when the headphones were powering on, and when they were powering off. Jolly good on all counts. 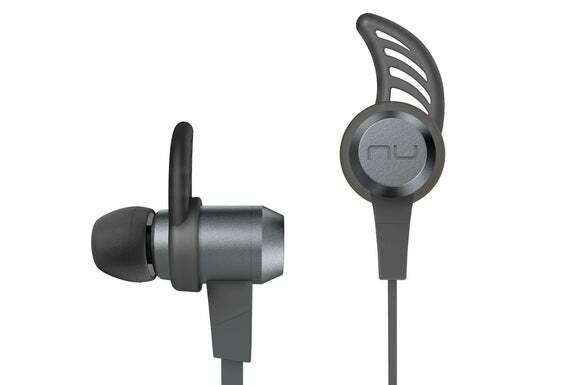 If you’re in the market for wireless in-ear headphones that can pull double duty for listening to music and handling phone calls, the NuForce BE6i are a very good choice, delivering plenty of value and performance for the money. 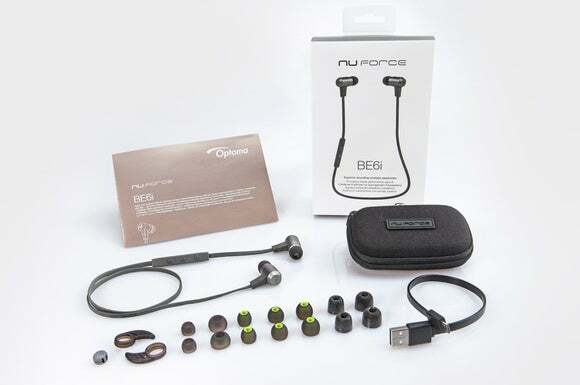 Wires will always deliver the best audio fidelity, but Optoma's NuForce BE6i Bluetooth headphones do a very good job without them.